Are you looking for Railway Group D Bengali Mathematics Practice set? If your answer is yes, then here is the best place for you. Mathematics is Important for All the Job Examination. Most of the students afraid of Mathematics. Therefore, they are the failure in examination. If you better performance on Job Exam, you must better result in Mathematics. 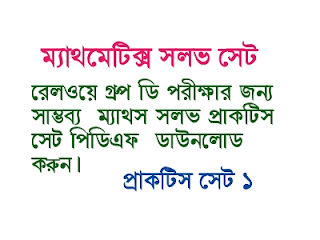 Most of the Bengali Students search on Internet Mathematics Bengali Practice set. But they can't find this practice set. GK Solve, solve this problem. Today GK Solve, share Bengali Mathematics Practice set handwriting notes pdf. Details of the pdf file and download link are given below. In this pdf, you can get Important some Mathematics for Railway Group D Exam with solve.Railway Group D Mathematics solve Practice set pdf below here. So the Bengal Candidates are requested to download this pdf practice set as soon as possible and start practice right now. Hope, this post is really helpful to you.